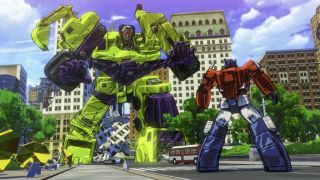 After a couple of early leaks pointing toward an Xbox release, Transformers Devastation has been officially announced and will be coming to PC. Developed by Platinum Games—with team members who worked on Bayonetta 2, Legend of Korra, and the director of Metal Gear Solid Rising Reveangance, Kenji Saito—Devastation is a third person action beat-em-up in the usual Platinum form. Fans of the classic Transformers series (that's pre-Michael Bay) will be pleased to see that Transformers Devastation is returning to an art style much closer to its roots. We saw Optimus Prime, Bumblebee, Megatron, and more fighting in the trailer above, in both their robot and car forms. Similar to Legend of Korra, Devastation will be single-player only and only on the side of the Autobots, but have five playable characters and over 30 Decepticon enemies.